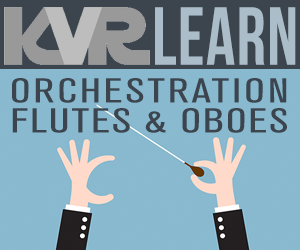 Acon Digital DeVerberate by Acon Digital is a Virtual Effect Audio Plugin. It functions as a VST Plugin, an Audio Units Plugin, a VST 3 Plugin and an AAX Plugin. Improve dialog and location sound. Forensic specialists can improve speech intelligibility. Attenuate reverberation in existing recordings. 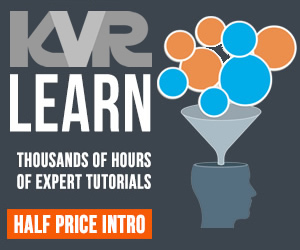 Boost the natural reverberation in existing recordings. Change the perceived distance in a mix by changing the balance between the direct sound and the reverberation. I spent some evaluation time with DeVerberate and I came away smiling. Acon Digital continues to pursue excellence across their whole product line. I can honestly report that this plug-in does indeed accord a tremendous degree of control over the amount of perceived ambience heard in any audio clip. I found that it was entirely possible to remove offending "room" noise from less-than-optimal vocal tracks. This plug-in makes it easy to edit a live club or large hall recording and bring "focus" to the music whilst greatly lessening unwanted, "boomy" reverberation. 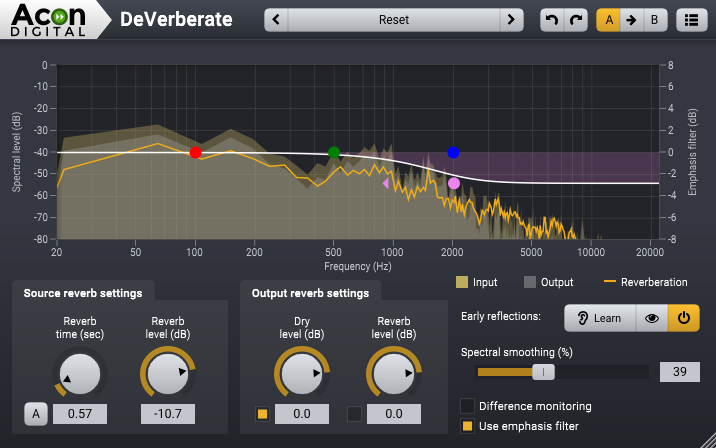 DeVerberate performs well and achieves better results than relying on transient shaping plug-ins for controlling ambience on prerecorded material. Priced at only $99, it deserves serious consideration in comparison to similar products costing three or four times as much. Of course, Acon Digital strive to improve all their audio-software on a regular basis, so future upgrades will assuredly keep this excellent "secret weapon" in the top tray of many engineers' tool boxes. My one niggle with Acon Digital plug-ins is that although you can manually type/enter values, this feature doesn't work in one of my favorite DAW's; "Mixcraft Pro Studio 6". Keyed in values are accepted in a couple of other DAWs that I've tested. Excellent price vs. performance ration. Attractive GUI (Buttons are a little difficult to manipulate). Easy to read and simple, straight-to-the-point workflow. Can I use Acon Digital DeVerberate with any of the following: Final Cut Pro (FCP7), Adobe Premiere Pro or Adobe Audition? Preferably I would like to use it with Audition. Thanks for the interest! Yes, DeVerberate works fine in all of these, including Audition. What about the delay it introduce? Is it good for live (like video streams, where big delays are breaking lipsink)? Thanks for the interest! There's a 1536 samples latency at 44.1 kHz so it's not ideal for real-time video, I'm afraid. 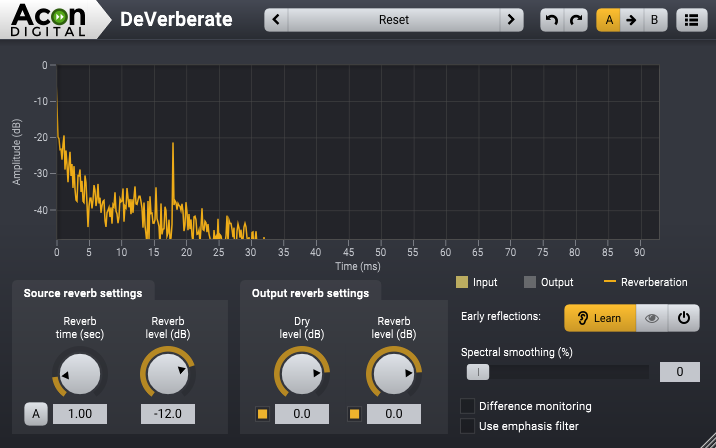 The early reflection filter has zero latency, so it's the reverb tail suppression that introduces the latency.